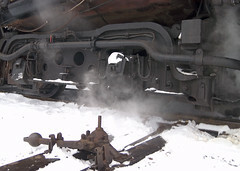 Steam Locomotives don't run often in the snow. The Steam Railroading Institute ran a series of Christmas family trips though in 2004 titled the North Pole Express. The trips ran from Owosso to Cheasaning (the North Pole USA), Michigan where the passengers enjoyed the indoor carnival (see the photos at MSTRP). It was a spectacular series of runs which generated some wonderful images. 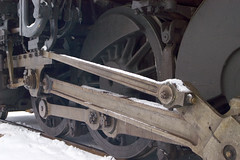 These three images were snapped the last weekend with snow on the ground and the locomotive. 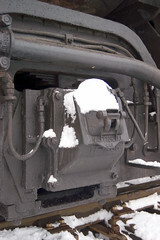 I took advantage of the crew's servicing time on the 400-ton locomotive to enjoy some of the details coating in snow.